In 2012, the Plague ended the world as we know it. In 2130, Charlinder wants to know why. The origin of the disease remains a mystery. Their ignorance of its provenance fuels a growing schism that threatens to destroy the peace that the survivors’ descendants have built. Unwilling to wait for matters to get any worse, he decides to travel to where the Plague first appeared and find out the truth—which means walking across three continents before returning home. Charlinder has never been more than ten miles from home, has never heard anyone speak a foreign language, and he’s going it alone. He survives thousands of miles of everything from near-starvation to near-madness before he meets Gentiola. By then he’s so exhausted that the story she offers to tell seems like little more than a diversion…until he hears it. Nothing could have prepared him for what he learns from her, and no one ever told him: be careful what you wish for. The world is a much bigger place than Charlinder knew, and his place in it is a question he never asked before. Charlinder's Walk is set 120 years after a world-wide plague that wiped out most of the world's population. Alyson Miers builds a fairly believable post-apocalyptic world for Charlinder and his village. Although the physical hardships he would have encountered in walking around the world may not have been as realistic as I would have expected. But it isn't until you get to the part where he meets Gentiola after traveling across North America, Asia and Europe that the real meat of the story begins. Not the that journey isn't a valuable part of the story - it is. The journey is important. But Gentiola's story is where you really start to think. I'll admit the paranormal was unexpected here and took me by surprise, and I found one line in one of the encounters between Charlinder and Gentiola crude, offensive and unnecessary, but one line out of an entire book is not a big deal. 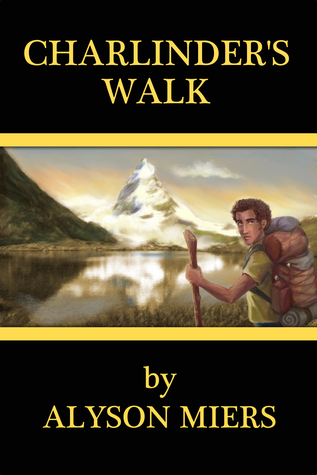 Charlinder's Walk is really a thought provoking book about many topics including religion, ecology, sexism, racism, education, morality, sexuality, family, and ethics. But it doesn't do any of this in a preachy or lecturing way. I'm glad Alyson Miers wrote it and I'm glad I read it. Alyson Miers was born into a family of compulsive readers and thought it would be fun to get on the other side of the words. She attended Salisbury University, where she majored in English Creative Writing for some reason, and minored in Gender Studies. In 2006, she did the only thing a 25-year-old with a B.A. in English can do to pay the rent: joined the Peace Corps. At her assignment of teaching English in Albania, she learned the joys of culture shock, language barriers and being the only foreigner on the street, and got Charlinder off the ground. She brought home a completed first draft in 2008 and, between doing a lot of other stuff such as writing two other books, she managed to ready it for publication in 2011. She regularly shoots her mouth off at her blog, The Monster's Ink, when she isn't writing fiction or holding down her day job. She lives in Maryland with her computer and a lot of yarn. 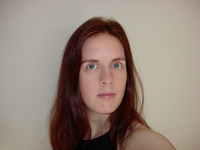 Connect with Alyson on her website, blog, Facebook, Twitter or GoodReads. Thanks for your kind words Stephanie. Tell me more about what you thought of it. I agree Carrie - I think the Gentiola bit was quite unexpected! Glad you enjoyed the review Abby. Have you read this one? What did YOU think?